Declassified documents refer to Menachem Begin as 'leader of notorious terrorist organisation Irgun'. Britain refused to allow Menachem Begin, "leader of the notorious terrorist organisation Irgun," to visit London in the 1950s, documents released by Britain's National Archives this week reveal. During the British Mandate in Palestine, when he headed the right-wing underground militia the Irgun, Begin was a bitter opponent of Britain. But in the first half of the '50s, as head of the Herut faction in the Knesset, he sought to open a new leaf with the U.K. He intended to visit the country, meet Prime Minister Winston Churchill and even recommend that Israel be added to the British Commonwealth. His plan had only one flaw - the British objected. The wounds were still fresh, Begin was still blacklisted as a dangerous terrorist, and the British had no intention of helping him legitimize his position vis-a-vis the governments of David Ben-Gurion and Moshe Sharett. The 34-page file released by the National Archives documents two of Begin's attempts to obtain a visa to Britain. The first, between 1953 and 1955, was rebuffed contemptuously. The second, after Begin had served as a minister in Levi Eshkol and Golda Meir's governments for three years, succeeded in 1972, five years before he became prime minister. Back in 1946, Begin's description in his file resembled something out of "The Protocols of the Elders of Zion," as if it had been re-written by Charles Dickens - "Journalist. Thin faced, bad teeth, long hooked nose, may wear black horn-rimmed spectacles." Later Begin had advocates such as "British lawyer" Max Seligman (as he was described in the documents), who represented the captain of the Altalena, the Irgun ship that was sunk by Israeli government forces in 1948. Seligman's successors at the law firm are defending former Prime Minister Ehud Olmert in his corruption case today. Seligman asked British Ambassador Francis Evans about the answer Begin would receive if he asked for a visa to lecture at Herut branches in Britain, meet officials and public figures, and most importantly - meet Prime Minister Churchill. Another associate urged that the episode be closed - "not dissimilar to other episodes in British history ... which have frequently ended up in happy and fraternal relations." The query raised a procedural controversy between the British Home Office - which is in charge of visas, aliens, the MI5 counterterrorism service and police - and the Foreign and Colonial Office. The latter described Begin as "the leader of the extremist right wing party in Israel, which advocates an aggressive policy towards the Arabs .... [A] visit by him would not do anything to improve our relations with the present moderate government of Israel." MI5, under the official guise of "Box No.500, telephone no. Regent 5050," said Begin "is also the well-known former leader of the notorious terrorist organisation Irgun Zvei Leumi, some of whose members have now become the Heruth Party." 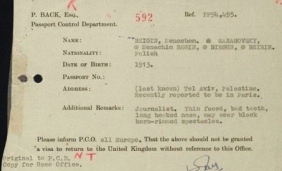 According to the MI5, "If there is any likelihood of Beigin being admitted to the United Kingdom, we consider that Special Branch [security service] should be informed immediately since the security responsibility responsibility for the Jewish terrorists in the United Kingdom rests with them." Both ministries agreed - no entry. At one stage the paperwork regarding Begin was stored away, to be discovered only months later. The visa was still denied. There are no indications that Begin's case, which was handled by mid-ranking ministry officials, had reached the political leadership. The officials had precedents dealing with visa applications of three Knesset members who had taken part in anti-British activity. One of them - Lehi leader Natan Yelin-Mor - was denied entry. Haganah head Moshe Sneh and Herut activist Esther Raziel-Naor were granted visas. A decade and a half later, after Begin had already served as a minister, he would visit British Ambassador Ernest John Ward Barnes at his Ramat Gan residence. Barnes wired to London that Begin was talking about Britain "in terms of friendship and admiration." He said times had changed and urged the government to allow Begin to visit the country. MI5 replied that while Begin himself was no longer considered a security risk, "we cannot guarantee that either militant Arabs or British subjects, who still remember his activities, might not make him a target if they happen to hear of his visit." That weekend, for example, supporters of the Popular Front for the Liberation of Palestine were to gather in London, MI5 said, implying that the reason for denying Begin a visa was related to his safety, as well as public safety. In 1971, this argument worked. In 1972, almost 25 years after the British Mandate had ended, the British grew tired of the battle and granted Begin his coveted visa.